"When the last of my perfume ran out over a year ago, I decided that I wouldn’t buy any more. Instead I would make my own. I finally got around to making some last week and thought I’d share my recipes with you. They are all really easy and fun. 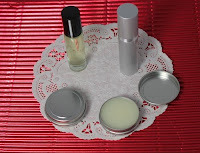 Today’s post is about solid perfume. JUST WONDERFUL! I learned a lot from you.